Maybe cabin fever is setting in after an unusually cold winter, or maybe it’s the fact that my husband and I have decided to move, after living in the same apartment for seven years. Lately, I’ve been on a decluttering/cleaning/stuff-purging frenzy. Over the weekend, I cleaned out our pantry. I tossed anything that was expired, and it was a depressing amount of stuff. Apparently, a few years back, I went on a spice-buying spree during which I purchased every type of spice known to man. Unfortunately, I used some of those spices two or three times and never touched them again. I guess I quickly ran out of uses for celery and fennel seeds. I hate wasting anything, especially food that someone worked hard to grow and harvest. I was disappointed in myself for not having used up what I already had or for buying things that I must’ve known I wouldn’t use all of. 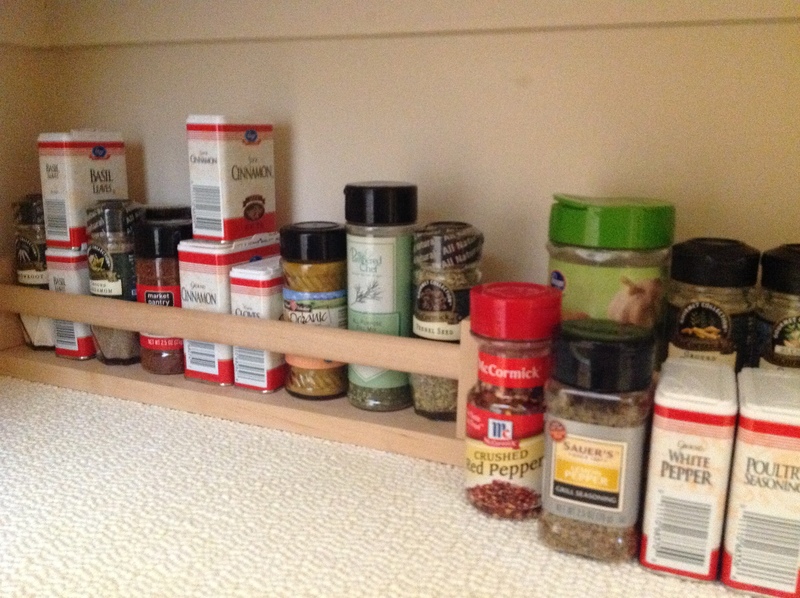 There is an upside: The spice rack is now alphabetized and all the expired goods have been purged. That’s good news, not just because it’s one less thing I’ll have to worry about when we move, but also because I’ve been on a cooking spree lately. A couple years ago, I was working multiple jobs and my husband was working full time and going to school part time. We didn’t have much free time, so we ate out a lot. Now that I’ve left my day job to write full time, I don’t have any excuse but to cook. Last month, we ate out twice: once when I had a meeting at Panera Bread with my critique group and another time when we picked up some doughnuts from a local bakery as a treat. Total, we spent $12 on eating out the entire month. With my well-organized pantry, I know exactly what I have, which means I can plan recipes and meals based on what’s currently in my cupboard. That means less waste—and less guilt. And it allows us to spend less at the grocery store, so we can save more quickly for a fully funded emergency fund and, eventually, a house to call our own. Next on my decluttering tour: the boxes and stacks of papers in my office. There’s no way I need every piece of paper I’ve been keeping. Since sheets of paper feel more personal than food—and don’t come with handy expiration dates—the process of tossing some of my papers will be tougher, but it needs to be done. I find this periodic decluttering serves several purposes. One, it increases my gratitude for the things I own. Two, it keeps my apartment tidier, which decreases my stress level. And, three, it helps me create a clutter-free, organized, and serene space to write, work, create, and live. All things considered, a much-needed decluttering session does wonders for my writer’s soul. 1.) Finish a draft of “Good, Old-Fashioned Magic”: 2,700 to 3,000 words per week. I’ve written 869 words in my WIP so far this week and am working on cleaning up a couple chapters to send to my crit partners. 2.) Read to hone my craft: Not much progress to report on this front. 3.) Blog at least two times a week, on Wednesdays and Sundays: So far, so good. 4.) Check in on Twitter daily and on WANA Tribe at least once/week: Yes on Twitter. Not yet on WANA Tribe. 5.) Comment on 5-6 blogs per day, Monday-Thursday: Done for Monday and Tuesday. 6.) Super-secret project: Write two articles/posts each week for that project: Wrote three articles, so I’ve already met this goal for the week. I didn’t do any work on this project last week, though, so I’m playing catch-up. Do you ever go on a decluttering spree? Are you suffering from cabin fever? And how are your writing goals for the week coming along? Congrats on your progress! I like having words to report, but sometimes you just have to do the less satisfying task of editing, unfortunately. I can imagine. We have a lot more stuff now than when we moved in seven years ago. We have more books, more furniture, more dishes, etc. Moving won’t be as easy as last time. Hopefully we stay in the new place for a few years! I find that the editing process has its own joys and frustrations. On the one hand, the piece already has most of its shape and structure, so there’s material on the page to work with. On the other hand comes the frustration when you know something is off but you don’t know quite how to fix it yet. January is always a turning point for me and I start cooking and cleaning more. I love spices and I use a lot in my cooking. My favorite spice is Tarragon. I use it on almost everything but especially my pastas. Even with using spices as often as I do, I wouldn’t doubt I have a few that need to be tossed. Looks like you are doing well with your writing goals, keep up the good work! A little trick I learned in our apartment hunting days was to looks for places slightly smaller than the place I was living in at the time. At least until I’d done the majority of thinning needed on my “stuff”…. As for the spices though… anything that is expired but doesn’t have salt in it could still be used as a threshing herb (cayenne and onion are good for deterring mice, fennel and parsley make good breath fresheners…). The intensity of the essential oils in most spices diminishes with age, but not completely, and yes, the vitamin concentration is pooey, but if you’re not expecting them to work as well as new, you CAN use them. Remember that dried spices are stronger than fresh, and use accordingly. Who said decluttering had to come with guilt? Nurture that creative soul! I usually don’t have much guilt over decluttering–only an inevitable sense of freedom and energy when I’m done. I just hate food waste. I will try out your suggestions. Thanks! Everyone once in a while I go on a big spree and drive Hubs and the kids crazy. 😉 But tossing celery seeds? Eek. I use celery seed or salt in almost everything! Good luck on your move.